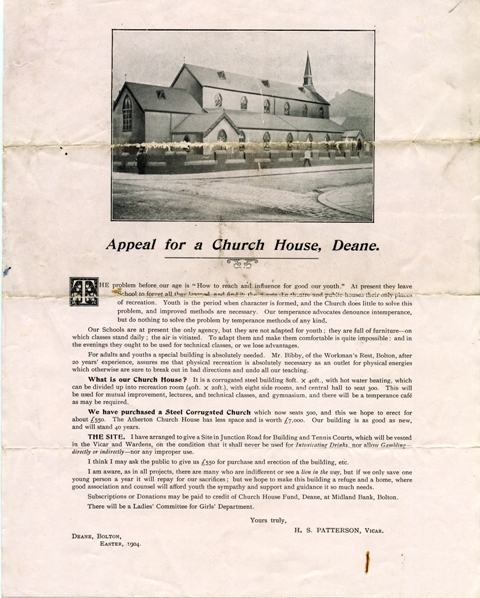 Appeal for a Church House, Deane. The problem before our age is "How to reach and influence for good our youth." At present they leave School to forget all they learned,and are found in the streets, the theatres, or public houses, their only places of recreation. Youth is the period when charcter is formed, and the Church does little to solve this problem, and improved methods are necessary. Our temperance advocates denounce intemperance, but do nothing to solve the problem by temperance methods of any kind. Our Schools are at present the only agency, but they are not adapted for youth; they are full of furniture - which classes stand daily; the air is vitiated. To make them comfortable is quite impossible: and in the evenings they ought to be used for technical classes, or we lose advantages. For adults and youths a special building is absolutely needed. Mr Bibby, of the Workman's Rest, Bolton, after 20 years' experience, assures me that physical recreation is absolutely necessary as an outlet for physical energies which otherwise are sure to break out in bad directions and undo all our teaching. What is our Church House? It is a corrugated steel building 80ft. x 40ft., with hot water heating, which can be divided up into recreation room (40ft. x 20ft. ), with eight side rooms, and central hall to seat 300. This will be used for mutual improvement, lectures, and technical classes, and gymnasium, and there will be a temperance cafe as may be required. We have purchased a Steel Corrugated Church which now seats 500, and this we hope to erect for about £550. The Atherton Church House has less space and is worth £7,000. Our building is as good as new, and will stand 40 years. THE SITE. I have arranged to give a Site in Junction Road for Building and Tennis Courts, which will be vested in the Vicar and Wardens, on the condition that it shall never be used for Intoxicating Drinks, nor allow Gambling - directly or indirectly - nor any improper use. I think I may ask the public to give us £550 for purchase and erection of the building, etc. I am aware, as in all projects, there are many who are indifferent or see a lion in the way, but if we only save one young person a year it will repay for our sacrifices; but we hope to make this building a refuge and a home, where good association and counsel will afford youth the sympathy and support and guidance it so much needs. Subscriptions or Donations may be paid to credit of Church House Fund, Deane, at Midland Bank, Bolton. There will be a Ladies' Committee for Girls' Department.